Green Mountain Power paid salaried employees $770,410 in bonuses for their work in this December 2014 storm. State regulators let the company collect the extra cash from customers. Green Mountain Power is the only electric company in the state using "Alternative Regulation" for its customer rates, and a VPR investigation found that regulators have allowed the company to collect millions of dollars from customers to cover costs that didn't meet the regulators' own standards. In the middle of December 2014, when a storm dropped heavy, wet snow across much of Vermont, the damage added up quickly. Green Mountain Power said the storm caused more damage than the historic ice storm that hit the state in 1998. Nearly 150,000 of the company’s customers were affected, documents show, and the company was all-hands-on-deck to repair the damage. Charlotte Ancel is usually responsible for the team at Green Mountain Power that figures out how much the company will charge customers in rates, but she said the company’s “customer-obsessed” philosophy meant everybody was doing what they could to help during the storm. They were also being paid well for their trouble. 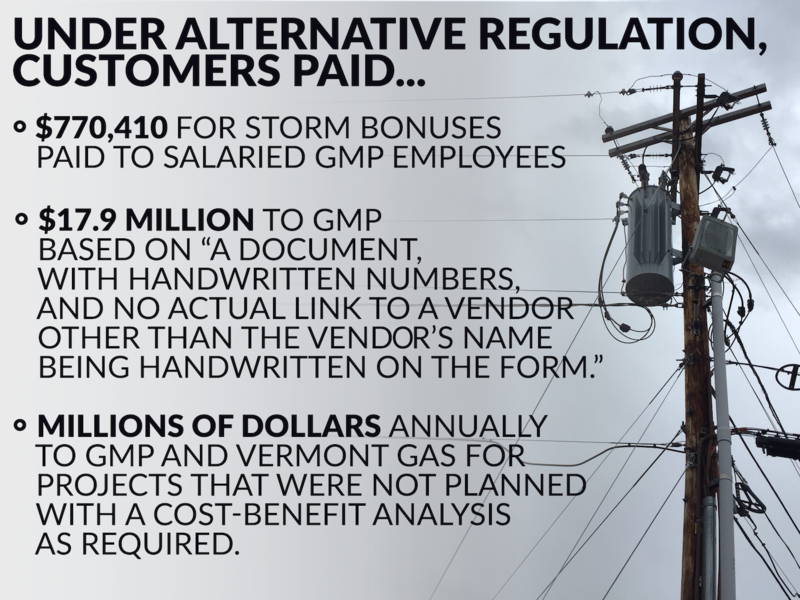 After the storm, Green Mountain Power paid $770,410 in bonuses to salaried employees who worked more than five hours during the storm. Then, Green Mountain Power got its customers – some of whom were without power for more than 24 hours during that storm, in the middle of winter – to repay the company all $770,410 for those bonuses. The Department of Public Service, tasked with representing Vermonters’ interests in utility cases, helped the company get that money included in rates, even as a consultant hired by the department said it shouldn’t be. “The costs for this storm are significant and for ratepayers to have to pay bonuses to salaried employees who are expected, as part of a salaried employees’ job, to work extra hours as needed is not appropriate,” wrote Bill Schultz, the consultant. Customers have been making payments on those bonuses for almost a year, ever since Green Mountain Power’s current rates went into effect in November 2015. Under Alternative Regulation, customers have consistently reimbursed Green Mountain Power for expenses the company wasn’t able to provide proof of, investments that were never analyzed for financial viability, and system improvements that weren’t yet online, documents show. None of that is consistent with the way regulation is traditionally done in Vermont, and the result is that customers for the state’s largest utility paid extra money for costs that don’t meet the state’s regulatory standards. Officials at the Department of Public Service say Alternative Regulation provides more frequent oversight than traditional regulation and allows the department to cut deals with utilities that turn out better overall for ratepayers. But records also show that Alternative Regulation has allowed Green Mountain Power to include charges in rates without first meeting state requirements designed to protect consumers. A VPR investigation, including an analysis of public records dating back to 2011, shows Green Mountain Power regularly fails to meet the state standards normally required for passing project costs on to customers. The Department of Public Service and its consultant regularly catch these failures. They don’t always reject Green Mountain Power’s attempts to make customers pay for the problematic costs, however. The result, according to regulatory documents, is millions of dollars in questionable charges being included in customers’ bills. In general, utilities have a monopoly on their customers. Most Green Mountain Power customers don’t have another option for their electricity, just as municipal water supply customers don’t have alternative sources for water piped into their homes. Monopolies become problematic when businesses arbitrarily overcharge customers who have nowhere else to turn for their product. The State of Vermont allows utilities to have monopolies because they’re regulated by the Public Service Board, which exists to prevent such overcharges. In essence, the regulation is designed to mimic competition – to make sure utilities like Green Mountain Power aren’t charging customers far more than it costs to deliver power to those customers. Regulators do this by closely inspecting the finances of utilities. If a company spends money on something that helps serve customers, and the company manages that spending appropriately, regulators allow the company to bill its customers to recover those costs. In traditional regulation, rate cases play out kind of like a court case: Utilities come before the Public Service Board and provide evidence that their request is based on actual costs. There is sworn testimony and cross-examination in a proceeding that is open to the public. The documents submitted as evidence are a matter of public record. The Public Service Board weighs that information and then rules on how much the utility will be allowed to charge customers annually. In a nod to the court-like nature of the proceedings, this process is also known as “litigating” a case. 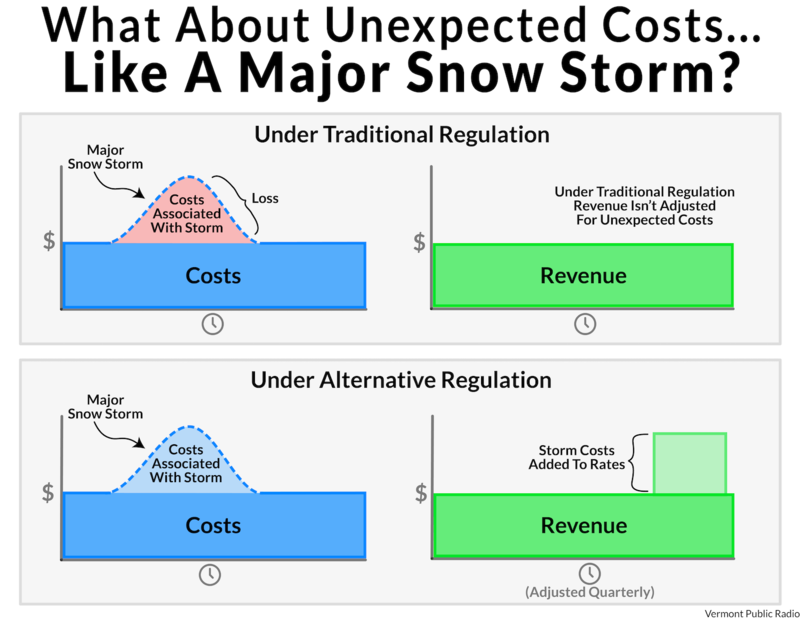 One problem with traditional regulation is that if a utility’s costs change dramatically – because of a storm, for example, or a pricing spike on the energy market – the company can’t change the amount it charges its customers unless it gets that change approved in another rate case. Alternative Regulation was created by the legislature to fix this. Under Alt Reg, as utility insiders call it, utilities are allowed to change their rates based on certain changes in their business costs. 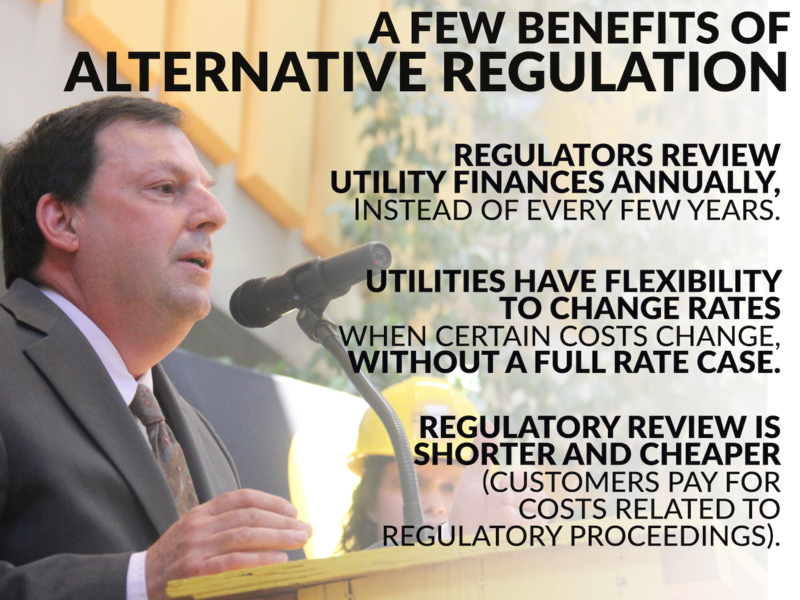 Utilities that choose to participate in Alternative Regulation are subject to annual regulatory review (as opposed to traditional regulation, which allows utilities to go years between rate cases). If traditional regulation resembles a court case, Alternative Regulation treats rate-setting like an out-of-court settlement negotiation. Every year, the Department of Public Service works with a utility to develop a proposal that both sides are okay with, then present that proposal to the Public Service Board for final approval. The only two utilities in Vermont using Alternative Regulation are Green Mountain Power and Vermont Gas Systems. Both companies are subsidiaries of the Canadian energy firm Gaz Metro. The problem with Alternative Regulation, critics say, is that the negotiation-style process used to determine rates is not as transparent as traditional litigated cases. The relative lack of transparency creates an environment where Department of Public Service Commissioner Chris Recchia and his staff are making determinations about what should be included in rates without documenting those decisions or providing any public explanation of them. Department of Public Service staff cannot recall an occasion in which the Public Service Board has challenged these decisions. As a result, decisions about what Green Mountain Power and Vermont Gas customers pay for are made largely outside the public eye. Proponents say Alternative Regulation provides some distinct advantages over traditional rate regulation. Even though both regulation systems are theoretically using the same set of rules to decide which costs are included in customers’ rates, the reality is more complicated. Documents show that in Alternative Regulation, the Department of Public Service and its contractor routinely set aside those rules in favor of compromise with Green Mountain Power. Reports from the department's own consultant show that these compromises allow Green Mountain Power to bill its customers for spending that was poorly documented, projects that were done without any up-front financial analysis, and costs that some say shouldn’t be charged to customers at all. Bill Schultz, the consultant who works with the Department of Public Service on Green Mountain Power's rate cases, warned in a report this year that the company applied a "blank check approach" in the most recent fiscal year. He said the company was showing a "lack of respect for the favorable regulatory process provided to GMP under Alt Reg." One of the most vocal critics of Alternative Regulation is Philene Taormina, the director of government relations for the Vermont chapter of AARP. Taormina keeps a close eye on utility rates in Vermont, she says, because many of AARP’s members are on a fixed income and are disproportionately affected by changes in utility rates. “In a traditional rate case, maybe consumers and ratepayers aren’t looking, but if they did, they’d see a complete open books of the utilities,” she said. These books tell the full story of the utility’s financial decisions, and the documents utilities provide are the basis for regulators’ decisions about how much customers will pay. This verification is the key element of rate regulation. Because Alternative Regulation more closely resembles a settlement negotiation than a court case, it’s harder for the public to keep track of the proceedings. Taormina says those storm bonuses Green Mountain Power customers are paying for this year highlight this problem. Recchia says the annual negotiating process under Alternative Regulation helps the department keep a close eye on utility spending, though he admits the public doesn’t get as full of a view. “There are advantages to the Alt Reg process in terms of efficiency and cost and the ability of us to really get into the weeds on specific issues regularly, as opposed to waiting for the utility to come in [for a traditional rate case],” he says. Green Mountain Power Vice President Charlotte Ancel says Alternative Regulation is a benefit to customers because the company gets scrutinized by regulators annually (with quarterly adjustments), as opposed to traditional regulation in which rate cases may be years apart with no regulatory oversight in between. Schultz, the department analyst who works for a Michigan firm called Larkin & Associates, conducts Green Mountain Power's annual review on behalf of the Department of Public Service. The end result of Schultz’s work is known as the “Larkin Report.” It outlines which of GMP’s costs Schultz investigated, which costs he thought customers should not have to pay and how the company responded. The report is available to the public and it serves as the definitive description of the vetting process of Green Mountain Power’s spending. Recchia says that while companies are supposed to file all of their supporting documentation with the board, which would make them part of the public record, they don’t always do that. In those cases, he says, some records that Schultz uses to make his determinations about rates never become public. Once Green Mountain Power has provided whatever proof it has, it’s up to regulators to decide what customers should have to pay for, and to explain why. After that heavy 2014 storm, Green Mountain Power asked regulators for permission to recover about $16 million in storm-related costs through customer rates. Included in that amount was the $770,410 in storm-related bonuses paid to salaried employees. According to the Larkin Report from 2015, Bill Schultz didn’t think customers should have to pay the company back for those bonuses. The report, which included a look at the $16 million GMP spent recovering from the December 2014 storm, strongly condemned the concept of making customers pay for those bonuses. Schultz also said that Green Mountain Power might not have had so many outages in that storm if the company had done a good job keeping danger trees away from its lines. “A second consideration is whether payment of employees bonuses are appropriate for ratepayers to pay when the level of damage and cost associated could be attributed in part to the Company’s decisions with respect to preventative maintenance,” the report said. The report goes on to detail documented proof that the company doesn’t trim trees along its lines frequently enough. 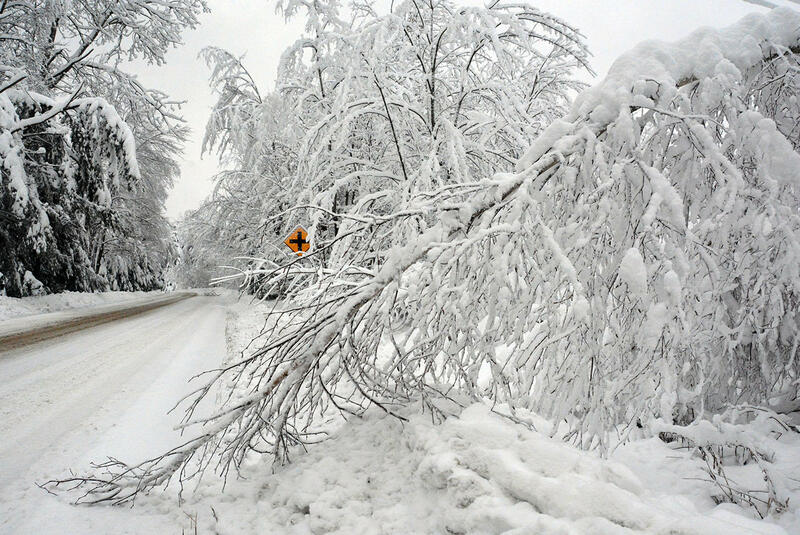 Heavy snow during a December 2014 storm brought town trees and branches all over Vermont, which led to nearly 150,000 outages for Green Mountain Power customers. Schultz recommended that regulators remove the cost of the bonuses from customer rates, but the Larkin Report says that never happened. “This adjustment [to the proposed rates] was not made, as it was ultimately resolved pursuant to a global agreement,” the report says at the end of the section about the bonuses. But it’s not clear that this “global agreement” even exists in writing. When VPR asked for a copy of the agreement in a public records request, the Department of Public Service responded that there is no such document. The agreement is, apparently, a verbal deal struck between the Department of Public Service and Green Mountain Power that determines which costs the company will try to recover from customers. Recchia said the agreement is represented in the form of the final rate filing from Green Mountain Power submitted to regulators at the end of the negotiating process. "In these type of Alternative Regulation rate cases, we reach a resolution and then the company submits a revised proposal and we concur with that or raise issues with that with the board," he said. "So that's the nature of it, so there's no signed agreement, per se." When it came to passing bonus costs on to ratepayers, the state department responsible for representing utility customers went against the advice of its own consultant and made an undocumented deal with Green Mountain Power. Recchia says there were other factors to consider that made the bonuses seem more reasonable to him. His reasoning wasn’t documented, though, and the Public Service Board approved Green Mountain Power’s rates shortly after the Larkin Report was released in 2015, without anyone having publicly explained why Schultz’s recommendation wasn’t followed. To Taoramina, the deal seems bad for customers. But her problem with Alternative Regulation isn’t just that it allows deals like this to go through – after all, the point of Alternative Regulation is to allow regulators and utilities to work out rates using alternative methods that might not be possible in traditional regulation. Taoramina’s problem with it is that there’s no evidence or explanation of what Green Mountain Power customers got in return for the $770,000 they wouldn’t likely have had to pay for under a different regulatory regime. If regulation exists to ensure that customers are only supposed to pay for costs that help bring power to them, how did those bonuses help? Reports by Bill Schultz of Larkin & Associates show that under Alternative Regulation, Green Mountain Power and Vermont Gas have made customers pay for a variety of costs that don't meet regulatory standards. The only publicly available assessment of the bonuses was Schultz’s analysis, which said the costs should not go into rates. When asked in an interview about the storm bonuses, GMP Vice President Charlotte Ancel explained why the company felt customers should pay the bonuses. After Sen. Tim Ashe, the chairman of Vermont’s Senate Finance Committee, read the Larkin Report, he emailed Recchia in November 2015, the same month customers began paying GMP for the bonuses in their bills. The email exchange was released by the department in response to a records request from VPR. In an email to Public Service Commissioner Chris Recchia, Chittenden County Sen. Tim Ashe asked for an explanation about why customers were paying for Green Mountain Power's storm bonuses. "Is it possible that GMP ratepayers are picking up, in rates, overtime expenses for GMP’s salaried employees related to putting in a few extra hours at work during a storm? That’s what it suggests in the Larkin report,” Ashe wrote. “If true, I think that is unbelievably problematic. As a salaried employee, I never once received a penny of overtime though frequently putting in 60 hour weeks. That’s the nature of a salaried employee. Recchia’s response explained why he thinks allowing the bonuses into rates is bad policy, then explained why the department chose to do it anyway. Recchia’s email indicates that Green Mountain Power customers got more than linemen with good morale for their $770,410. The Larkin Report, which serves as the only available record of those concessions, says generally which costs Green Mountain Power agreed to remove from its rate request, but there is no indication of which costs were removed in exchange for the inclusion of the storm bonuses. Recchia’s email doesn’t say either. In an interview, Recchia listed some of the concessions Green Mountain Power made in those negotiations. Recchia’s email to Ashe also explained why the department didn’t fight Green Mountain Power more aggressively about the storm bonuses. The department could have forced the company before the Public Service Board for a more traditional, court-style “litigated” case, but Recchia opted not to. Recchia later acknowledged that Alternative Regulation didn’t provide a good enough record of the decision-making process for the storm bonuses. To Taormina, this type of determination is exactly the problem with Alt Reg. Recchia takes issue with this characterization, but he says the department is taking steps to become more transparent. Recchia said the department is addressing that shortcoming with further documentation. The annual board filings now include summaries of how the negotiations between GMP and the department changed the rate proposal. The department is also planning to begin annual reports that document what the department’s advocacy achieved in a given year. For now, questions linger about the value of Alternative Regulation. Are Green Mountain Power customers paying more because of Alternative Regulation? Are they getting a better deal than they would under the standard regulatory process? The Department of Public Service says it's been able to use the process to negotiate fair rates and quality service for Vermonters, but documents also clearly show that customers are being forced to pay for costs that don't meet regulatory standards. Without a clear explanation of what those customers get in exchange, it's impossible to know how much value Alt Reg provides. Disclosure: AARP Vermont provides underwriting support to Vermont Public Radio. Clarification 2:48 p.m. 9/9/2016 This story was edited to reflect that the storm bonuses were charged to customers using the Alternative Regulation system, but not necessarily because of Alternative Regulation itself. Regulators have decided to take a close look at three of Green Mountain Power's newest programs to see how much value they bring to customers. Recordkeeping at Vermont Gas Systems is so sloppy that Vermont’s consumer advocate made exceptions to consumer protection rules in order to prevent “significant financial hardship” for Vermont Gas, according to expert testimony filed with regulators. Fred Bever reports on electricity. An epochal transformation in the way energy is made, delivered and used in the U.S. is under way, and in Maine an experiment in what’s called a “non-wires alternative” could disrupt electric utilities’ traditional business models by averting the need to build expensive new transmission infrastructure.